CIA Veterans Gather To Honor Duane Clarridge, A Sometimes Unsubtle Spy : The Two-Way Clarridge, who headed up the agency's anti-communist efforts in Central America in the 1980s and was indicted and pardoned in the Iran-Contra scandal, died April 9. Duane "Dewey" Clarridge, a CIA veteran, speaks in May 2007 during an Arkansas Committee on Foreign Relations luncheon in Little Rock, Ark. The retired spy criticized the CIA's leadership and said a lack of human intelligence had led to mistakes in Iraq, Iran and North Korea. In Purcellville, Va., on Saturday, CIA veterans are gathering for the funeral of one of the agency's best-known and most flamboyant characters — Duane "Dewey" Clarridge. Clarridge, known both for founding the CIA's Counterterrorism Center and for his role in what became known as the Iran-Contra scandal, died April 9 at the age of 83. 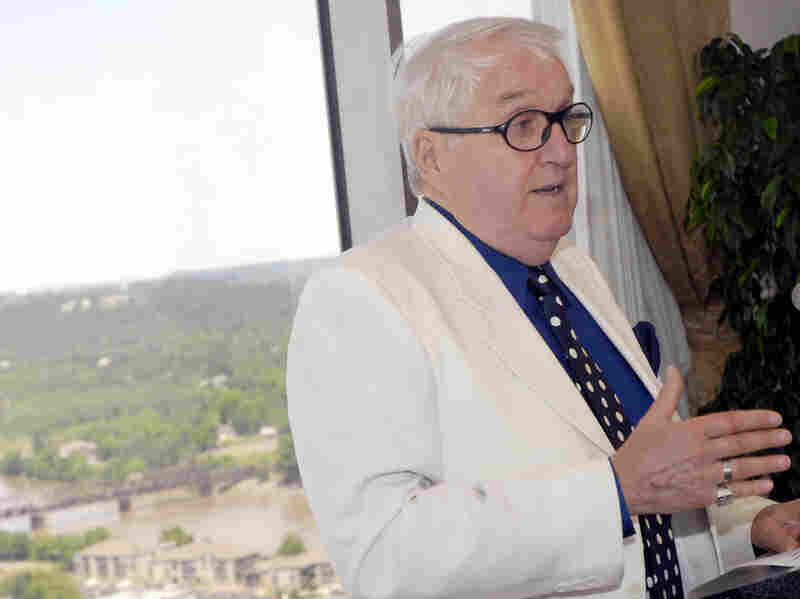 For a man who chose to live in the shadows — operating for more than three decades at senior levels of the CIA's clandestine service — Clarridge was not given to shyness or understatement. Rather, he was known for swagger, a taste for gin and scotch, and for showing up at work sporting all-white suits with flashy, silk pocket squares. In the early 1980s, Clarridge served as chief of the CIA's Latin America division, a perch from which he ran the CIA's covert war against communism in Central America. He was indicted in the Iran-Contra scandal, but pardoned before the end of his trial by the first President Bush. Before Clarridge died, he left instructions that his ashes be placed in a silver-plated artillery shell. He also requested that his friend and colleague, Charles Cogan, write a special poem for the occasion. Cogan confirmed to NPR that he plans to recite the poem, Calle de la Paz, at the funeral service. Cogan, who later rose to the role of CIA station chief in Paris, says he first met Clarridge in the 1950s, when they were both young intelligence officers. "I was at end of my first tour in Delhi, and he'd just finished a tour in Kathmandu," Cogan said. "His family didn't [immediately] accompany him to India, so he lived with me. We didn't share the same ideological positions, but we became friends." Decades later, on Jan. 1, 1990, Cogan says he paid his old friend a visit, at his then-home near San Diego. "Somehow the subject of his funeral came up, and he asked me to write a poem," he says. "And I enjoyed doing it. The title is Spanish for 'street of peace,' and there are a lot of references to Nicaragua and the Iran-Contra days in there, including an incident where Nicaraguan rebels attacked the port of Corinto." Cogan says he also plans to use the occasion of the funeral to share where Clarridge got his pseudonym, Dax P Le Baron. "It's kind of James Bond-ish sounding, but it's all a reference to France and to Dewey's family," Cogan said.